We planned. We tried. 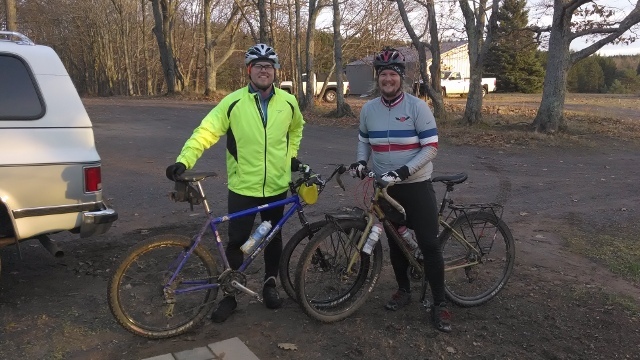 But other things prevailed and our first ever team ride became James (an interloper) and me on mountain-ish bikes. James showed up this afternoon, much to the concern—and then joy—of Dog. We decided to ride trails, so I opted for my trust rigid MTB, still in race configuration and not yet prep'd for winter commuting. After some light trespassing on a property for sale, we followed a barely-even-gated road that popped us out on the power line trail between South Range and Painesdale. James, "totally [knowing] where we are" pointed us to Redridge, and we got lost. After a bit of backtracking, we made it out to Freda, and then scooted up to Covered Dr. Not long after, James "knew" another shortcut. After crashing a few times and traversing what were probably several back yards, we popped out at the end of E.B. Holman Rd. Pretty much exactly where we started before hitting Covered Dr.
A bit of a slog up Liminga Rd and then S Superior, and we were back at the ranch. Covered in mud and grinning. It sounds like I'm bitching about the shortcuts and getting lost, but it was really a lot of fun. The weather turned out pretty nice for November, and it felt good to get out and get tired.